Lightly toast the desiccated coconut and nuts until golden brown. Cool slightly then place in a food processor or blender with the pumpkin seeds. Pulse on and off to coarsely chop. Do not over process. Stir in the flaxseed. Swirl the berries through the yogurt. 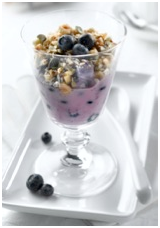 Spoon the yogurt mixture into three or four glasses and top with the nut and seed mixture. Storage: The nut and seed topping will keep in an airtight container for up to 2-3 days. Best assembled and eaten immediately.